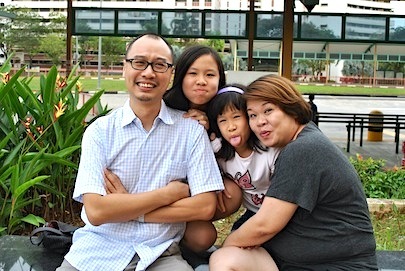 Dads for Life catches up with Radio Personality Maggie Lim and her husband, Eugene Lau, on their partnership as parents. Maggie was the first female to be a local panel speaker at a Dads for Life Conference, on 12 May 2012, where she shared her perspective on parenting. Tell us about yourself and the family. Maggie: I’m a radio DJ at Gold 90.5FM and I’m more sports inclined. In school, I played tennis, I ran and was on the school netball team. The only thing I can’t do is cycle. Eugene: I’m an engineer. I enjoy sketching and painting with watercolours. I’ve been painting for about three years. Drawing is an extension of what you can express, just like music. Maggie: We have two girls, Josephine Faith Lau and Jillian Metta Lau who are 12 and 9. They are very into cycling, which I can’t do at all. Josephine takes after me in that she loves Korean dramas, so we’ll compare notes about who the cutest guys are, much to the disdain of her father. Josephine likes to draw which I think comes from the influence of her dad. Eugene: Jillian is sports inclined, and she’s very vocal like her mom. Josephine is quiet like me. Identify a parenting strength in your partner. Maggie: Eugene’s key strength is his understanding and his ability to think like a child. It is the fundamental reason why the children seek him out, whether it’s for fun or for certain issues. He has this ability to code switch from an adult to child. I’m more of a disciplinarian. I play with the girls but, I can’t be too playful with them if not they’ll think, “Okay I can walk all over Mummy.” Eugene’s ability to switch makes it easier for him to communicate with the girls. I know perfectly well they don’t tell me certain things, but they go to their father, and he in turn will come and tell me. Eugene: Sometimes the children climb over my head because I’m a little bit more easy-going and soft hearted. But for Maggie, she draws the baseline so we work with that baseline. How do you share parenting and household tasks? Maggie: Eugene has been very hands-on from the time the girls were babies all the way to now. I’m very thankful for that. I think it made motherhood much easier because I had a partner who was helping me. I think I would have gone stark raving mad if I had to deal with two children alone with overnight feeds and whatever it is and still have to tend to the house as a wife and as a working individual. Eugene: The process of helping out was just very natural. I don’t treat it as housework, but as a thing that needs to be done. It’s more of a duty and a responsibility. For example, I’ll iron all the girls’ uniforms at the end of the week to prepare them for the week ahead. Maggie will do the laundry and the cooking, and I’ll do the washing. It’s a very complementary relationship that we have. It’s really not easy for women nowadays and doing housework isn’t a male or female thing. It’s just something that needs to be done if you want to get on with your life. Dads for Life Conference 2012 Speaker, Dr John Ng, said that conflicts are to be expected because we are all different, but it is possible to manage them positively. What’s your take on this? Maggie: I’m a Catholic and Eugene is Buddhist. With Eugene being a Buddhist, the children will fundamentally follow the Buddhist way of life. They go to the temple; they observe the Buddhist rites and all that. When it comes to Christmas, it’s a huge affair for my family, but I’ve watered it down since it’s not something Eugene and the girls are used to. We still have the celebration so that the children get to enjoy it. But I don’t bring on everything and drag the kids to church and Mass. Eugene: I wouldn’t say it’s a conflict but we came to a compromise on the issue of the kids’ religion. Margaret’s a Catholic, so the kids are supposed to be Catholic. Still, she understands my position and she gives me the responsibility to teach the kids. When they come of age, they will be given the choice on what they want to be, Buddhist or Catholic. Have there been times when things were out of sync? How did you work it out? Maggie: One of the issues that we used to have was about making decisions in front of the children. So we agreed that whatever disagreements we had would be kept behind the scenes. Even if I disagreed with something he said, I would only discuss it out of earshot from the children. It’s not easy, and we used to have spats over it, but after a while we realised that we were being silly fighting over the children. Eugene: We are far from being perfect parents, but we learn along the way what to do. There is never a handbook that says for this problem: “Do ABCD to solve it.” So, we just handle the situation case by case, based on the circumstances there and then. If it’s the wrong decision, we fine-tune it next time. Nothing’s cast in stone, we’re still learning. Maggie: I think it’s when the children are able to come to you and tell you what their hopes and aspirations are, and they can talk to you as a friend. My elder daughter is in the tween years and it gives me great joy that she still comes around to tell me things, and can open herself up to me. Eugene: The most satisfying or gratifying thing is that there is now more than one person that cares for me. The girls do things for me in their own little ways to show me that I’m needed. Even at 12 years old, Josephine still needs me to tuck her in every night. Even though I say, “Come on, I’m very tired, I need to sleep,” deep down inside, I’m glad I can still give the girls some kind of solace.